Weavers from various fiber guilds that belong to the north west association (ANWG) made great efforts to welcome us to their 2017 conference on the UVIC campus in Victoria B.C with two lovely banners. The conference theme was Treadle Lightly which meant that conference materials, guild booths and displays tended to focus on the use of natural, recycled, low impact and re-purposed materials….tread lightly on this earth. Our conference neck pouches, which were created by my weaving friend Alison Irwin, were cleverly woven in strips of re purposed paper. Alison taught a class on this technique at the conference and created a wonderful piece in woven paper for the Instructors’ Exhibit which you can see later in this post. 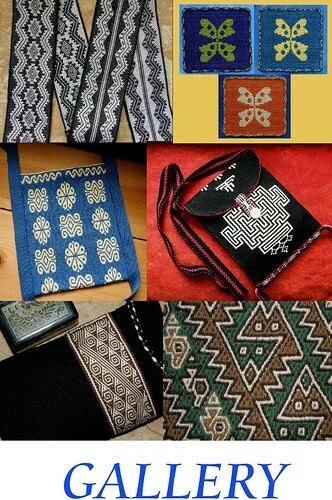 I photographed Terri’s conference pouch when I dropped by to see her Saori weaving class….”Saori Weaving – Adventures in Weaving and Cloth Design”. I was happy to meet the famous Salt Spring saori artist about whom I had heard so much. All the instructors were extremely welcoming. We all offered an open house during the lunch break on Day 2 of the pre-conference workshops and several of my students volunteered not only to stay in the room to welcome visitors but also to weave on their backstrap looms so that people could learn a little about how they work. The conference tote bag was really special. It was made from an old sail….that task must have required a lot of sail cloth as I heard that conference attendance exceeded 600! The bags were very practical and beautifully constructed. They contained a travel mug for water to reduce plastic water-bottle waste on the campus. This first banner welcomed us and helped us easily locate the main meeting area and check-in building. It was created using local fleece from Parry Bay Sheep Farm in Metchosin, BC by a spinning/fibre group of the Victoria Handweavers and Spinners Guild. Rosie Kerschbaumer & Toby Smith wove it along with the other members of the GVWSG Block Study Group. The First People’s House sits on traditional territories of the Coast Salish and Strait Salish peoples. The site was once a village and holds great cultural and historical significance. The Welcome Post sculptures were created from red cedar by Coast Salish artisan Doug LaFortune. This Welcome Post is titled traditional Coast Salish Wife/Mother. My picture shows the child in the mother’s arms. Victoria Harbor was set up for a warm welcome with pavilions in place to mark Canada’s 150th anniversary. I loved seeing the tiny water taxis zipping about. There was certainly a festive feel as our ferry pulled up at the dock. The trip up from southern Washington state was long (on top of a 28-hour journey up from Bolivia!) but, who could complain with such scenery along the way? It was an intense conference….aren’t they all?! I taught for four and a half days and finished with a half day free to cover ground and explore as much as I could of the campus. I wanted to see the totem poles, the conference exhibits, the guild booths and vendor hall. Of course, I had made several hasty and brief visits to the vendor hall whenever I had had the chance where the good people of Redfish Dye Works, Ellfe and Sandy, were happy to re-supply me with more of their luscious 60/2 silk for my next backstrap loom project. Somehow during the nights my ideas for the next project would evolve and I would find myself back at Redfish, maybe to exchange a color or pick out others. I hope to get this on the loom when I return to Bolivia in late August. And all this in beautiful Victoria B.C with its mountain views and ”Canada 150” celebrations in full swing down at the harbor. We had six days of stunningly gorgeous weather with just the hint of an approaching change as we sailed out of the harbor on our way back to the USA. There comes the ferry for our scenic 90-minute crossing. Whales were spotted on the return trip….not by me, though. On the trip over to Canada, one of my backstrap weaving buddies, Tracy spotted me on the ferry as I wandered about. She was arriving with another backstrap weaving friend of ours from Arizona, Kristin, with whom we had only had contact online. You may remember that I showed Kristin’s silk piece in my last blog post. Tracy and I have woven together before but this was the first time that we were meeting Kristin. There they were sitting together on the ferry spinning. Those two were inseparable for the rest of the conference and I regret not being able to hang out more with them. They only stayed for a pre conference workshop, the class on making a traditional Japanese bamboo reed with instructor Bryan Whitehead, a Canadian, who has been living in Japan for decades. Another backstrap weaving buddy from Arizona, Christine, with whom I manage to weave every fall, also took that class. I can’t imagine three people who were more suited to that reed-making class. Bryan Whitehead must have been so happy to have three such enthusiastic students. Of course, I am sure that all his students were just as deeply interested in learning that ancient skill. I was lucky to be passing by Carol and Sharon’s dorm-room one evening. They heard my voice and called me in. While Sharon worked on the tablet weaving she was learning in John Mullarkey’s class, Carol worked on her bamboo reed and I was so pleased to be able to watch some of the process. Not that I will ever be able to do something like this on my own! I own some fine bamboo reeds and I now have an even greater appreciation for how they were made after watching Carol work and hearing from Tracy, Kristin, Christine and others about the tremendous amount of preparation Bryan put into this class. He cut and shaped hundreds, if not thousands, of slivers of bamboo…just amazing! The slivers of bamboo are placed within the frame and cord is hitched around the posts to keep them in place. The cord also maintains even spacing between each sliver. Students could choose various epi-s for the reed from 15 to 24, I believe. The size of the cord they used determined the resulting spacing of the bamboo pieces. Each bamboo piece was placed and locked into position with the hitched cord. Then it would be gently tapped with the hammer you see on Carol’s table. Here is one of the old Japanese reeds that Bryan brought to show to the class. Kristin was able to show it to me one day. And here is Tracy’s finished reed. From what I could tell from watching the process, it really took some dedication to finish that in the three-day class! This is an heirloom! There is no reason why this should not be still around and being used by a weaver two hundred years from now. That thought makes my hair stand on end. I can’t wait to pick up the old reeds I have at home (I got mine from a lady who sells textiles and implements from Chinese minorities) and examine them and think about the person who painstakingly prepared and put all those little pieces of bamboo in place. Imagine if they knew that the reed would end up in Bolivia. I will certainly take good care of them and use them. I already have a project in mind that will require the use of one of the reeds. It has been inspired by the conference. This piece was part of the Instructors’ Exhibit and was woven by instructor Marilyn Robert. I ran into one of her students on the way back to my room. There on her loom was a gorgeous indigo-dyed strip of cloth with a lovely white cross of double ikat. I have dabbled in warp ikat and I think that if I ever have the courage to try double ikat, then these kinds of patterns might be a good place to start. Of course I won’t have the benefit of Marilyn’s knowledge, experience and instruction and I won’t use indigo, but I feel very inspired to try something like this. I will get to use my bamboo reeds to create the necessary balanced structure on my backstrap loom. While I am showing you things from the exhibits, let me show you the piece that Carol James brought…an awesome sprang garment that just takes your breath away. It is draped with one of Carol’s finger-woven pieces. She taught both skills at the conference. And here is the promised picture of Alison Irwin’s unique paper-woven chess pieces posed on her handwoven chess board…brilliant! Alison Irwin took my 3-day pre-conference class on complementary-warp pick-up. She was also my volunteer helper. It was so nice to connect with her again after meeting her at Braids 2016 in Tacoma WA. 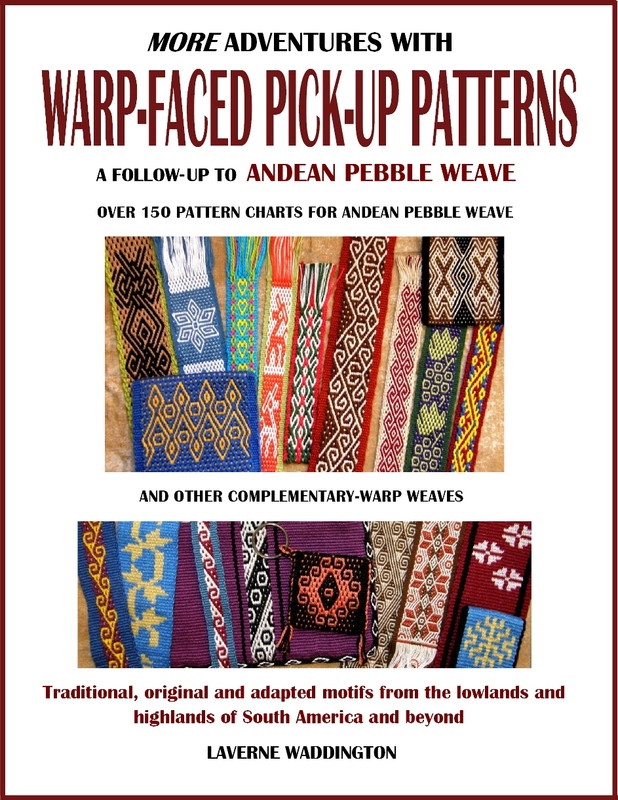 We had a shared interest in the warp-faced double weave structure that is used in Bolivia and I was happy to be able to introduce her now to complementary-warp pick-up. And, it was nice to be able to inject some backstrap loom enthusiasm into my group of weavers from Canada, the USA and even New Zealand! It was great group of people. If anyone needed more ideas on what to do with their woven patterned bands, Alison brought along a pouch that she had made from a band she wove on her inkle loom and which I believe was recently included in an issue of Handwoven. This and her matching paper bracelet are gorgeous. The pouch uses a supplementary-warp technique. Both pieces are so elegantly finished and very inspiring. I love how the pattern on the folded flap so cleverly aligns with that on the body of the bag…all so clean and crisp! 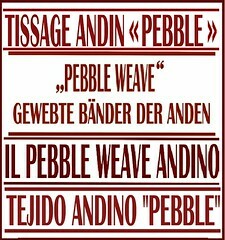 I also taught a one-day class on the ñawi awapa tubular band and then a half-day backstrap loom ”taster”. 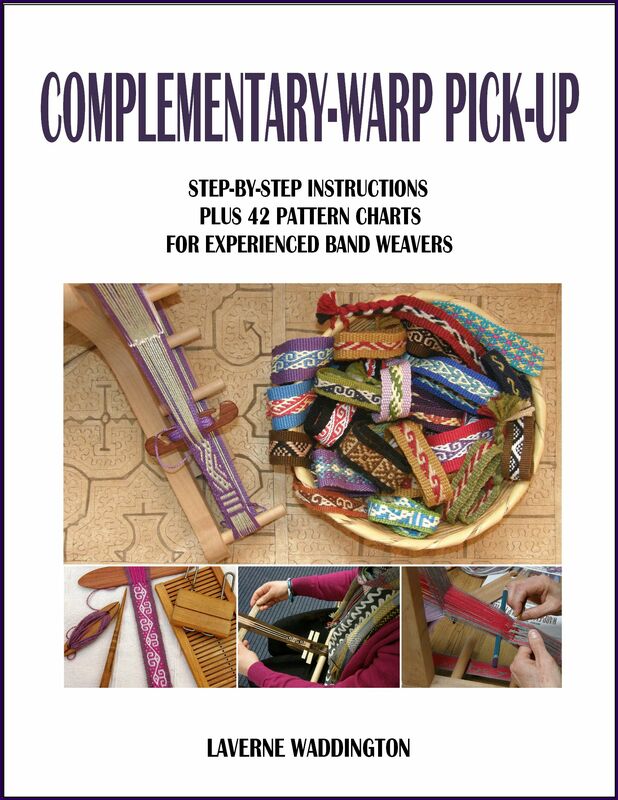 In this half-day class I teach how to use the body to operate the sheds on a narrow warp and we then learn the basics of complementary-warp pick-up. We had a lovely pattern well underway by lunch time and everyone took home charts for at least five more. I have to say that this particular group was very vocal when I showed them how easy it is to open a clean heddle shed when you know how to move your body. It’s very rewarding and exciting for a teacher when you get reactions like that. I felt like I had pulled a rabbit out of hat or something! Well, yes, it is something like magic when you learn how to ”be the loom”! I enjoyed my teaching…can you tell? My students are very focused here as they take their first steps in one of the more complex 16-thread patterns. Day 3 of the class has them almost unconsciously and automatically adjusting their body positions to operate the loom smoothly. They have become the loom. They are better able to spot mistakes quickly and deal with them and have developed good strategies for following charted patterns with long repeats. I was happy to have Jen with her delightful Scottish accent in my class. We had met at the banquet at ANWG 2013. Who knew that we would meet again like this? This picture is from the ANWG 2017 blog. Quite a few classes were being held in the building in which I was teaching and on my floor and so I got to poke my head into several rooms on the way to the bathroom but that was just the tiniest fraction of all the conference had to offer. I actually didn’t get to see everything on my floor. I was so impressed that one of the conference organizers, Anita Salmon, with whom I had been corresponding for months before the conference, managed to pop her head inside my classroom every day to check if all was okay. She must have covered some ground! She even brought me a bag of Peruvian textiles that she had collected in the time she lived in Peru in the 1960’s and 70’s so that I could show them to my students…and enjoy them myself! Rebecca Mezoff’s classroom was very eye-catching as you were immediately met by a scrumptious display of colorful tapestry yarn. Her topic, ”Predicting the Unpredictable. Color in Tapestry” sounded fascinating. Having seen Betty’s work with spun paper from her class, I am wondering if this has anything to do with the way Sandra Brooks from New Zealand created her extraordinary woven book which was part of the juried exhibit. This four-selvedge woven sheet was folded into pages which were full of interesting textured images and even words. I was really taken with this and I wish I could have done a better job of photographing it. I was happy to be able to spend a little time with Sandra as she had been a participant in my three-day workshop. My silk piece in the Instructors’ Exhibit made it onto the table next to the lovely cedar bark basketry of Polly Adams Sutton (at the back) and Joan Carrigan. The guild booth displays were interesting and so varied with themes that closely followed the overall conference theme of ”Treadle Lightly”. The booths were judged by Jacquetta Nisbet and I was disappointed not to have been able to meet her. We exchanged some emails a few years ago and I would have loved to have met her in person. The friends with whom I traveled to Victoria are from the Portland OR guild and I was pleased to see their booth receive several awards. Their pieces were based on the theme of recycling and my favorite part of their display was the fact that each piece had a card with a personal and entertaining story behind its loving creation. Apart from the visual appeal, those stories really drew me in and helped me get a sense of the people and personalities behind the work. Here is Eugene Weavers Guild’s booth to show you just one example. Again, TIME! !…so little of it and so much to see! The fashion show was wonderful. I have misplaced my program and so I can’t tell you how many pieces there were but the show lasted close to ninety minutes and moved along at a good pace with several injections of good humor which included a troupe of hot male bods modeling what looked like colorful knitted boxer shorts. I do hope the creator of those eye-catching pieces will forgive my inadequate description. We were all somewhat distracted by the models! Competition was fierce with a number of very close finishes and one dead heat. I think I managed to capture some of the fun and energy in this shot. I believe the viking shuttle was the overall winner. Mindy Swamy, who was the race caller and time keeper, did a wonderful job and gave us all lots to laugh and smile about. She was just as highly energized in my half-day class and I really enjoyed meeting her. On the final evening, key note speaker Charlotte Kwon of Maiwa Handprints Ltd took us on a journey to India via her superb videos so we could learn all about the concept of ”slow cloth”. I hope that others write blogs about their ANWG 2017 experience as I feel that I have covered so little! If you do happen to run across other accounts, please let me know so that I can link to them from this post. Look for more pictures on the ANWG 2017 blog. Laura Fry was at ANWG as an instructor but she was also there to present the official invitation to ANWG 2019 in Prince George B.C. Many thanks to the conference organizers and all those wonderful volunteers who made this a conference of ”many welcomes”. I will leave you with this picture of one of the poles that I found on the campus. It was designed and carved by Charles W Elliott, Coast Salish, and is a ”History Pole” that depicts the Salish S’YEWE story. 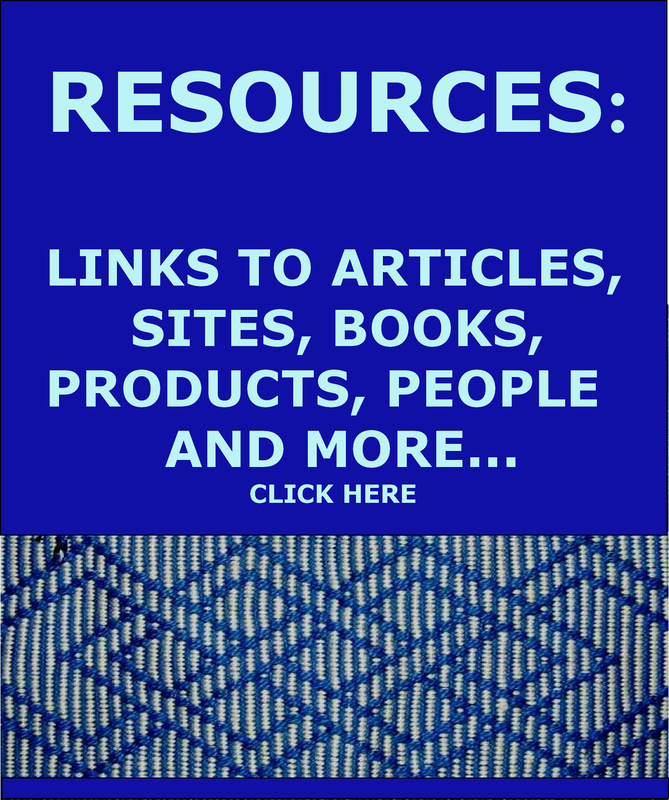 « Backstrap Weaving – A Job Worth Doing…. Thank you for sharing this – amazing post! I recently came across Bryan Whitehead’s web site through Pinterest images of one of his Japanese backstrap looms, so how cool to see his name in your post! I hope you’ll some day post something on your blog about them. It looks like an amazing combination of a loom frame with backstrap weaving. What lovely descriptions of the event! Thanks for filling in the gaps…there were so many things I did not get to see and photograph. The class I took was so magical and I’m glad we could share our experience with you. Marilyn Robert’s ikat piece was also one of my favorites. I loved the bold ikat on the narrow cloth all flowing together like a waterfall. It was great to meet you and I hope our paths cross again some day! WOW, the conference sounds fabulous! The organizers are to be applauded!! Laverne, I always love reading your blog, but this one gets the blue ribbon from me. Thanks for letting me share your experiences at ANWG 2017. Thanks so much for a peek into what looks to have been an awesome conference! I always enjoy your posts so much. Wow, what a wonderful time you and all other weavers had at this conference! All of the classes you described look so interesting and fun – the cedar basket weaving, bamboo reed, and paper and bookmaking. And of course your classes, which I wish I could have attended! I liked the woven chess board, patterned band pouch, and how about those boxer shorts! I recognize your silk piece from some of your previous blogs, and the completed piece is truly gorgeous. It was nice to know a little of the story of its creation. Their theme and everything created around it were exciting to see. I know everyone had a great time, learned so much, made new friends and went home inspired!